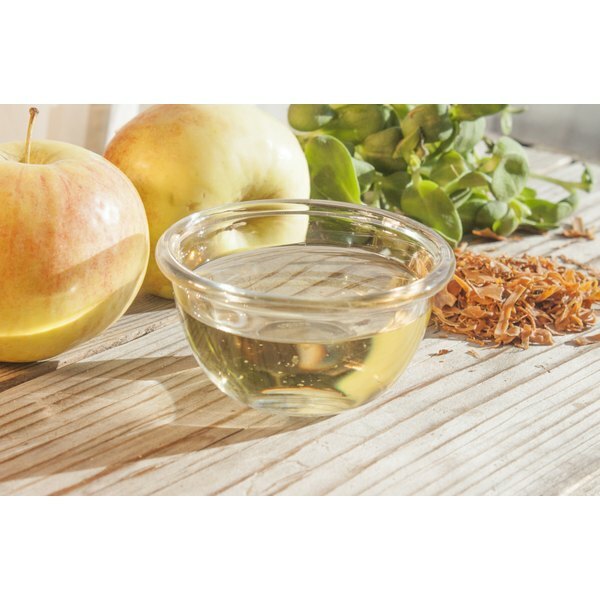 Apple cider vinegar -- a type of vinegar made from apples -- is a folk remedy for a wide variety of conditions including bursitis, a painful condition that affects the pads that cushion your bones and tendons. Proponents claim that although apple cider vinegar is acidic, it helps make your body more alkaline and that this effect can help heal a number of conditions. There is no scientific evidence showing apple cider vinegar is effective for bursitis. Bursae are fluid-filled pads that cushion the tendons, muscles and bones near your joints. When these pads become inflamed, it is known as bursitis. Your shoulders, elbows and hips are the most commonly affected areas, according to MayoClinic.com. You may feel achy and stiff, or the area may appear red and swollen. See your doctor if the pain lasts more than 2 weeks. Recurrent flare-ups are common, but in most cases bursitis goes away within a few weeks of resting the affected joint. Apple cider vinegar is one of the oldest home remedies, according to Deidre Layne in her book "Apple Cider Vinegar: A Modern Folk Remedy." Layne claims apple cider vinegar can restore alkalinity, which reduces inflammation. Layne adds that the minerals in apple cider vinegar help balance fluids. She says an imbalance in electrolytes can lead to a number of conditions, including arthritis and allergies. Balancing fluid volume is critical for conditions such as bursitis, according to Layne. Layne recommends soaking a towel in apple cider vinegar and wrapping the affected area for several hours each day. Apple cider vinegar provides minerals that help promote fluid circulation between cell walls, which can help reduce pain and swelling, according to Layne. Or drink an apple cider vinegar tonic with each meal, suggests Layne. Make this by stirring 2 tsp. of apple cider vinegar into a glass of water. Due to lack of clinical data, use apple cider vinegar only after discussing it with your doctor. The most common bursitis cause is overuse from repetitive motions or injury, according to MayoClinic.com. You can also find some relief simply by resting the affected joint and protecting it from further injury. Do not use home remedies in place of professional medical care. What Are the Treatments for Bunions Without Surgery?